An overview of the game and tutorial of how to play. Delve deep into Catan! 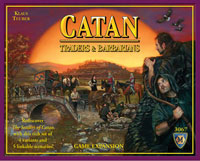 In Catan: Traders & Barbarians you'll find lots of cool new ways to explore Klaus Teuber's award-winning game series. You can now play with just 2 players! Add a harbormaster, a friendly robber, or special events. Play with a wealth of new wooden pieces and capabilities. You can even link your games to create an intriguing campaign. Use these 4 variants and 5 scenarios to reinvent your Catan experience! The Fishermen of Catan- Fish in the great lake or try casting in rich coastal shoals. A fresh, expanded, and updated version! The Rivers of Catan- Not one, but two, great rivers invite flourishing commerce. Bridge them en route to glory and wealth. The Caravans- Nomads of the oasis seek wool and grain. Camel caravans offer trade. Barbarian Attack- Eager for booty, vile barbarians land and occupy Catan's fertile shores. Brave knights unite and ride to battle. Traders & Barbarians- Your wagons transport fine marble, glass, tools, and sand to help restore Catan's castle to splendor. Combine these rich scenarios to create a compelling campaign! This expansion set for Settlers of Catan can be summed up in the word – value. It doesn’t merely do one thing to the game, or change it once and that’s the extent it. Instead, it includes five different scenarios that each play quite different from each other. They are presented in the rule book in order from least complex to most, and I’ll do the same here. The Fishermen of Catan replaces the desert with a lake inhabited with fish, as well as coastal areas that are ‘good fishing spots’. What I like about this scenario is that it curbs the feeling of “I have to be in the middle of the island or I lose”. Add in the Harbor Master variant included with this expansion and the highly contested areas of the island could be found anywhere. While the fish are not a resource in the same sense as wood, sheep, wheat, etc., they can be used for a variety of purposes depending on how many you spend, even to ‘buy’ a resource of your choice. Finally, this is an absolutely fantastic way to play Settlers of Catan two-player. So, while this set includes rules for a two-player version, I highly recommend using this instead. The Rivers of Catan adds an element of gaining wealth along rivers as a way to (hopefully) achieve victory points. Just don’t be the poorest and lose a point. There is the added layer of decision-making as to whether or not some coins should be spent for resources. It’s a nice scenario but only play it now and then. The Caravans introduce a voting and political negotiation element to Settlers of Catan that can be quite intriguing. This is one scenario that plays better when using the 5-6 player expansion for Catan: Traders & Barbarians. Controlling the route that the caravans take can be lucrative but the cost of wool and grain to get the votes must be considered. Barbarian Attack provides an arena in which players cooperate against a common foe in the form of the barbarians, while still vying for individual victory. This can be a very fun scenario but has just a little bit more randomness than normal (where the barbarians attack and whose knights fall in battle). Traders & Barbarians is the most complex of the scenarios but that’s not to say the it is difficult to teach or learn. Anyone with Settlers experience will catch on quickly enough. It adds travel to the island whereby each wagon moves around the landscape picking up building materials for the castle. Upgrade your wagon to move around quicker and even possibly defend against bandits. Beyond the five scenarios, Catan: Traders & Barbarians also provides several variants to be added to the base Settler game or to scenarios. The most commonly used one (we always play with it when playing Settlers) is the Harbor Master which acts similar to Largest Army and Longest Road in that it awards 2 Victory Points if you own it. It is awarded to the player with the most “Harbor Points”, i.e. Victory points from settlements and cities which are on harbors (minimum of three points on harbors). Highly recommended for use in any Settlers game. The event deck is a great variant when you just don’t want to use the dice. This helps to even out the odds of numbers producing but does not guarantee the odds. It reduces luck but not eliminate it. There are also events on some of the cards that can make the unexpected benefit or untimely bane occur. The Friendly Robber aims to allow players the change to get things going before being subject to the robber. The two-player variant, in my opinion, is entirely unnecessary thanks to the Fishermen scenario, and isn’t as fun. So, overall, this expansion set is well worth the purchase if you play Settlers of Catan at all. Traders and Barbarians is not a single expansion like Seafarers or Cities & Knights. It’s really a bunch of mini expansions that allows you to customize your basic Catan play without adding too much. I haven’t played all the extras, but I like that when parts of Catan get old, I’ve got something to add. Some of the mini-expansions really only tweak the game a little, but others can really alter the game. The biggest expansion called “Traders & Barbarians” kind reminds me of Cities & Knights “lite”. My kids love the “Fisherman of Catan” addition, because you try to get fish which allow you to do some neat things like move the robber or get certain resources. I always play with the “HarborMaster” card now, because I like adding another path to victory through putting settlements on harbors. The Catan cards which replace the die is another nice tweak if you’re tired of rolling die and never getting certain numbers. The cards almost guarantee that one of your numbers for resources will happen, and they have special events that add some variety to the game. If you’re looking to spice up Catan with a lot of variety, Traders and Barbarians is the way to go! Though the original is a modern classic, this expansion adds alot of options for more varied gameplay. Love adding the fishing aspect, include this into pretty much every game. More options for collecting resources is always a plus, kids get more involved with this. The rivers are interesting, adding gold to the equation, and the bridge building gets very strategic. Haven’t plated the caravan expansion yet, may someday, but like everything else this expansion adds. The Barbarian scenarios, really change the strategy of the game entirely, making allies a must, at least until you need to double cross them. It easily incorporates into any other Catan game with many different mini scenarios that add extra dimmension to any Settlers game. I really loved Settlers of Catan. I’ve played hundreds of games with my own set. It was the first gamer-game I ever bought. I then played the heck out of Cities and Knights and Seafarers. I love the game. I stopped playing when I tried Traders and Barbarians. I already owned the “small” expansions like the great river and the fish (i do love the fish, they are a great addition to the game), so those components were not new to me. The other scenarios were junk. I played them each once, put the game away, and went back to my Cities and Knights. I disliked the game so much, that I don’t play it anymore. It may have more to do with my expanding game library, but I don’t play Catan at all. This expansion left a bad taste in my mouth. I’m sorry to leave a poor review of the game (because the site is so positive, and that’s a good thing) but I feel I have to tell people when to avoid wasting their money. Try the game first, and if you like it, then you can tell me how wrong I am later. 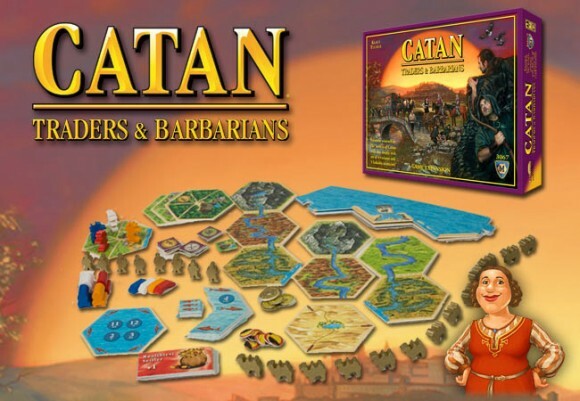 Add a Review for "Catan: Traders & Barbarians"